I’ve been flicking through some of my craft books to find something easy to make while recovering from the flu. I have a complete set of ‘Stitch by Stitch – The illustrated Encyclopedia of Sewing, Knitting and Crochet.’ which was published in 1984. There are 20 volumes and lucky for me, the ones I have are all in excellent condition. You can sometimes pick these sets up at book sales and on eBay – keep your eyes out for them as they are wonderful. Lots of basic and advanced instructions with detailed illustrations. The projects range from clothes (kids & adults), household items and toys. There are a few different editions, so the covers may look a little different than mine. The three projects below are ones that caught my eye today as they are quite fun and cheery. 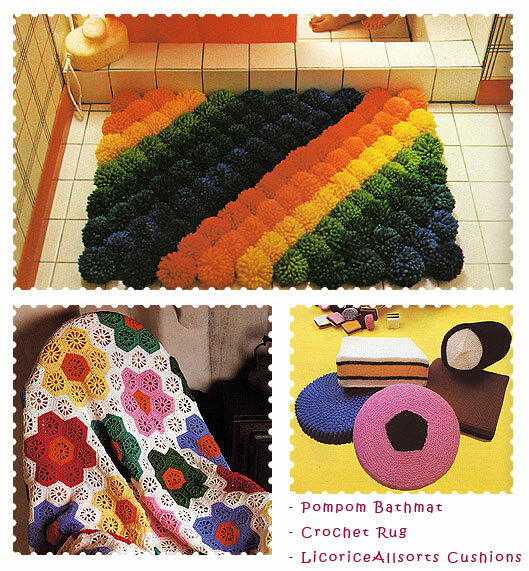 I really want to make the pompom bathmat, that would feel so good and sqooshy under your feet! If you’d like to make one of the projects above and just cannot wait until you get your hot little hands on the books, I found some links with similar projects. Pom Pom Rug from Super Minx. It’s from a vintage craft card set, neat! Anjie from Pom Pom Emporium (super cool name) mentions a book that has a pattern for a pom pom rug plus she links to a free pattern from Lion Brand yarn. My Google Fu failed me and I couldn’t find any patterns for licorice allsort cushions or similar projects. But I did find a recipe for Licorice Allsort slice. You need something yummy and sweet to fuel creativeness! The recipe is from Taste.com.au, a site that is awesome for finding delicious recipes. Really worth checking and bookmarking. The photo of the slice is from Taste. And of course, the lovely Pip from Meet Me at Mikes has a wonderful set of video tutorials so you can learn how to crochet. oh my gosh, I have been away for the weekend, and look at all the goodies I have missed. I hope you are feeling better soon, ugg, that horrid flu went through our home too and it’s just double ugg!! I am totally hooked on Camomile tea at the moment, and can’t seem to get enough of the stuff. I so love that hexagon crochet rug and the bath mat. 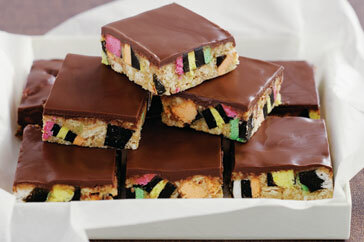 As for licorice allsorts, hmmmm, delish!! I am going to have to make this one. It is one of the worst flu’s I can remember. Hubby and I are still battling it – two weeks later. I just got antibiotics and a nasal spray – ewww! Not fun. Ooh I love Camomile tea! Plus rose hip…actually most herbal teas by Celestial Seasonings. ok Celestial Seasonings is now on my grocery list. will give some of them a go. Yes, i hope to make that slice next week. will share. 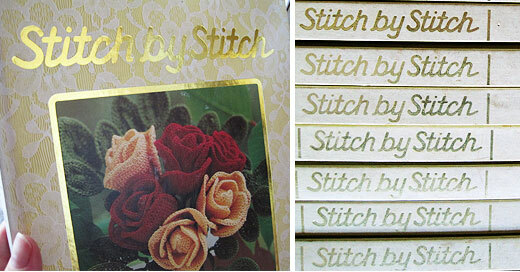 I have recently came across a few copies of the ‘stitch by stitch’, I am really interested in the sewing part, just wondering, do you know anything about the pattern pack thats said in the book ? I mean , is there sewing patterns sold separately ? Thanks.